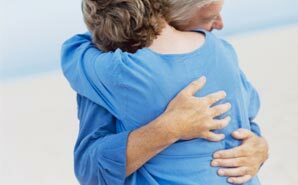 Read on to discover the funny, sad and touching reasons why you need a big ol’ hug. I have been on Code Brown alerts all morning! I’m six weeks from giving birth and three weeks from the end of my third semester of nursing school. My chair just rolled out from under me and I landed on the floor in front of two nurses, a patient, a PA and a rep. So I hurt my tailbone and my pride. And boy does it hurt! I deal with human frailty in the raw on a daily basis. I am halfway across the country from my young daughter and furry friends on a prolonged travel assignment and haven’t had a hug or kiss since June. I need that hug to hold me up after 13.5 hours on my feet with no lunch break. Despite how I feel when I care for my patients, I keep a smile on my face and give my 100 percent attention to them. I work in a locked psychiatric facility and I am my own security (yikes)! I need a hug more than you…on second thought, you may need it more, and I’m blessed to have one to spare. Here, have one on me. Why do you need a hug today?